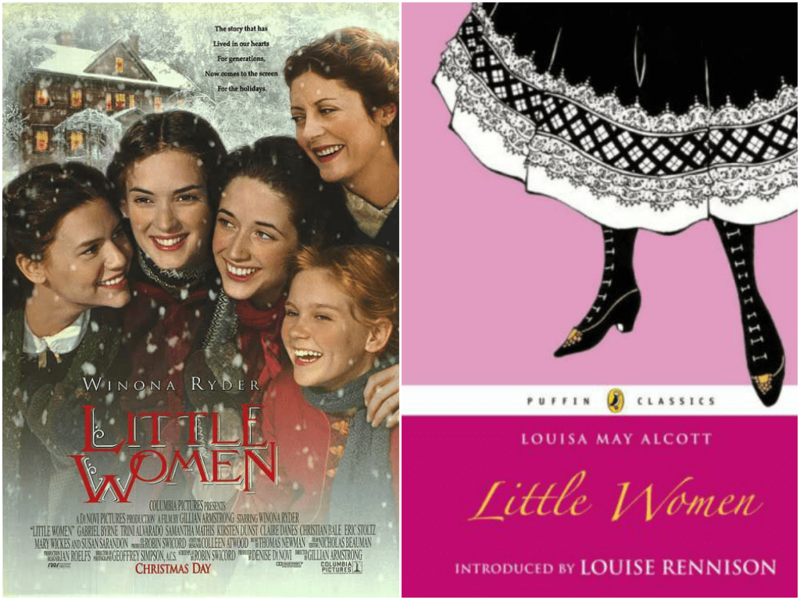 I think Little Women is all about coming of age. It focuses mostly on Jo, but also on her three sisters, from their youth to their early adult years as they go through separation from their father, simple Christmases, sickness, suitors, adventures, and tragedy. Through it all, I think Louisa May Alcott really captured the spirit of growing up quite well. I love that in the end, Jo writes her and her sisters’ story after a tragedy stirs her heart of Professor Bhaer’s words to write from her heart. I think it’s important advice for all writers to heed. I adore this movie, i haven’t read the book though. It’s on my to read list, hopefully i can read it by the end of the year. Nice choice! It’s a great book; I hope you enjoy it! Is it sad that I haven’t read the book OR seen the movie? I mean, I feel like I must have had SOME exposure to this story when I was younger, but I really can’t recall it at all. One of these days I’ll have to fix that. Definitely check them both out when you have the chance! It’s one of the few classics I really love. I’ve not read the book, and I’ve actually rewatched this recently. I had forgotten that Christian Bale had played Laurie, and that was partly the reason I had watch it again. So I definitely remember that scene. I’m a big Christian Bale fan, and it is fun to see him so young in this film! Susan Sarandon was an awesome Marmie!! She did do a great job! I read the book a while ago, but I don’t think I’ve seen any adaptations! I must check this one out, especially with such a great cast! You should; it’s great! This one is from 1994. Love the book (or I should say books, I enjoyed Good Wives and Little Men just as much) and the movie. Winona IS Jo, she portrays her perfectly. The scene that kills me every time is what happened Beth. I never read Good Wives, but I actually didn’t like Little Men very much, which made me so sad because I really wanted to. It felt sort of slow and I didn’t connect to the stories and new characters in it as well. I do agree that Wionna was an amazing Jo! I think Good Wives is more in the spirit of Little Women so you might enjoy that more. I’ll have to check it out sometime then. This is for real my favorite movie ever, and I have always identified with Jo. I have a love/hate relationship with that scene as well. I so want her to be with Teddy, but at the same time, I know he’s ultimately not right for her (in a romantic way). They make great best friends. I’ve always identified with Jo as well! And ugh, yes, I’m always like, “Choose Laurie! Choose Laurie!” But then when I see her with Professor Bhaer I know they are probably a better match but dang… it’s heartbreaking, because I seriously love me some Laurie. I LOVE that scene..so good! Are you on team Laurie or Prof. Bhaer..I know a lot of people think she should have gone for Laurie but I agree they wouldn’t have been happy together! I’m conflicted! Every time I watch the movie, at this scene I want it to change to where she will choose Laurie, but then by the end I’m always thinking maybe it is best for her to be with Prof. Bhaer, but it is brutally hard for me. I just adore Laurie. Ha ha, he is old! And yes, why did Laurie and Amy have to get together?! Seriously?! I’d love to see a show of Little Women sometime!